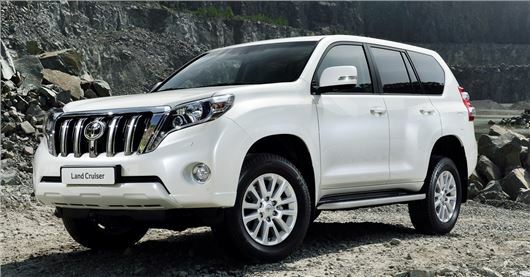 Toyota is now taking orders for its facelifted Land Cruiser, with prices starting at £34,995 and deliveries commencing from 1 December. The updated SUV range gets a more aggressive grille, sweptback headlights and an enlarged front bumper. Daytime running lights are now standard, with the headlights positioned higher to make them less vulnerable to damage when driving off-road. Toyota has also revised the rear lamp units and introduced a range new alloy wheels. Inside, the Land Cruiser gets Toyota’s latest Touch 2 multimedia system, which lets the driver interact with the car by using a ‘drag and swipe’ gesture to access Tom Real Time Traffic alerts and Google Street View. Toyota has also incorporated a new 4.2-inch TFT colour screen to display off-road data, such as angle gauge, traction control on each wheel and the status of the differential locks. The Land Cruiser’s 190PS 3.0-litre turbodiesel engine has been revised to reduce emissions to 209 and 214g/km for the three and five-door models respectively; however, performance remains the same, with 420Nm of torque available from 1600 to 3000rpm. There are three trims to choose from - Active, Icon and Invincible – although the three-door model is only available in Active grade, with 17-inch alloy wheels, LED headlamps and cruise control fitted as standard. Icon trim starts at £47,495 and adds automatic transmission, seven seats and parking sensors. The range-topping Invincible will cost £52,495 and feature rear electric and adaptive variable suspension, along with sunroof and multi terrain monitor with four cameras.